In recent decades Knoxville has made earnest, albeit small, attempts to recognize it's musical history. There was the "Tribute to Country Music Park," complete with a fiberglass sculpture of a giant treble clef. The clef is gone, but the park remains. We have the "Cradle of Country Music Walking Tour", however I can't say that I've seen many people walking it. We used to have the Midday Merry Go Round, when WNOX featured artists that shaped early country music, weekdays at lunch. Now we have the WDVX Blue Plate Special, not exactly the same thing but it makes for good listening. One particular item that will stand out in the minds of old time music lovers would be the digitalization of the St. James recordings. Fast-forwarding from the 1920's to the 1970's, one finds Knoxville undergoing some serious exercises in urban renewal. One of the more ambitious projects during that period was the remaking of Summit Hill, from part of the coherent grid of downtown streets into a meandering boulevard. No other project has altered such a large part of the area traditionally known as downtown Knoxville (we will discuss the urban renewal of East Knoxville in a later post). In one fell swoop, seven or eight city blocks (depending on how you count) and City Hall park were all erased. Most of the land is now covered with the sweeping curves of Summit Hill Boulevard. Part of it is the aforementioned Tribute to Country Music Park. Some of it lies under two of Knoxville's most recognizable, newer buildings, the twin TVA towers. None of it looks like the Knoxville that once was. The buildings fell unceremoniously and practically no one shared any concern as Knoxville's strongest claim to music history was transformed into rubble. There's nothing there now. 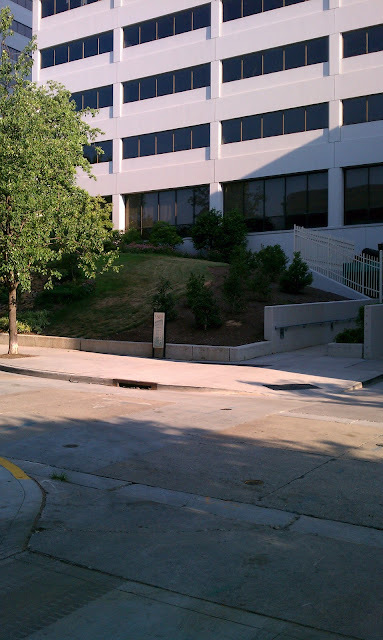 If one starts at the intersection of Gay Street and Wall Avenue, walking westwardly, one passes an older building on the left, the Lerner Lofts, and a building that looks somewhat old but isn't, the TVA Credit Union, on the right. 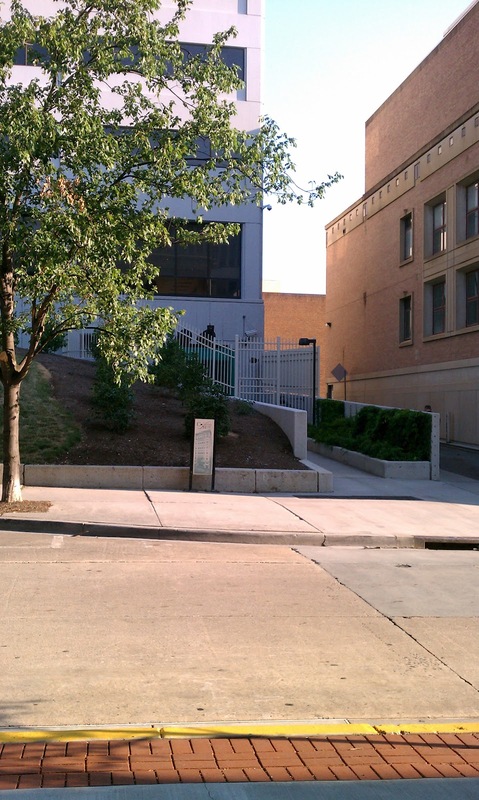 Just after the credit union there is an alley. Then there is a grassy hill and a gated entrance to the TVA East Tower. That's it. 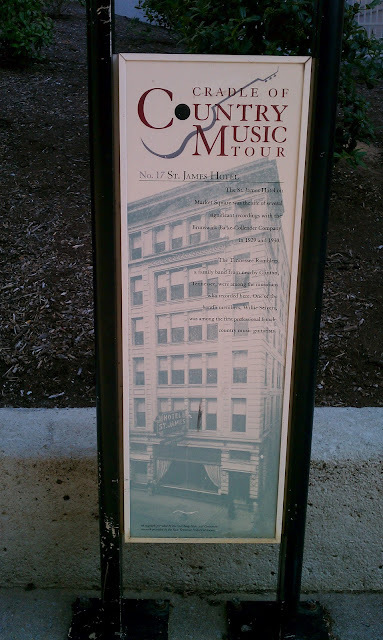 That's the St. James Hotel, the building in which the recordings took place. It could be worse, as in another surface parking lot. If anyone takes the Cradle of Country tour, (and I'm sure somebody has done it...surely) they would see that the ghost of the St. James is recognized on this placard. It feels a bit like a grave site. 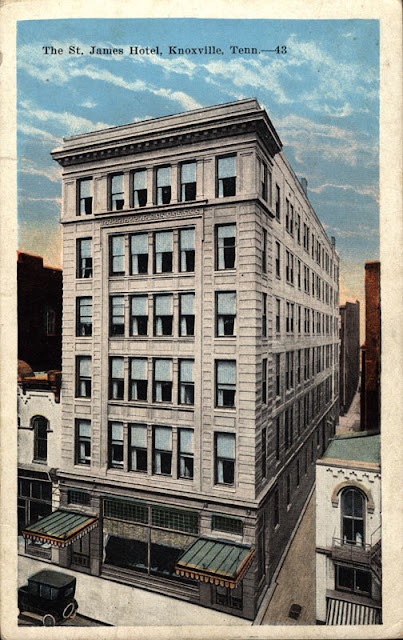 The St. James Hotel began life as the Vandeventer building (perhaps not the easiest title for the English tongue) in 1905. The building has been described as a fortress. It was composed of concrete with an ornamental facade. It wasn't the most attractive building in downtown, nor was it the least. It was the tallest building on its block and the second tallest on Wall Ave, six stories. The big selling point at the time was that it was "fireproof." 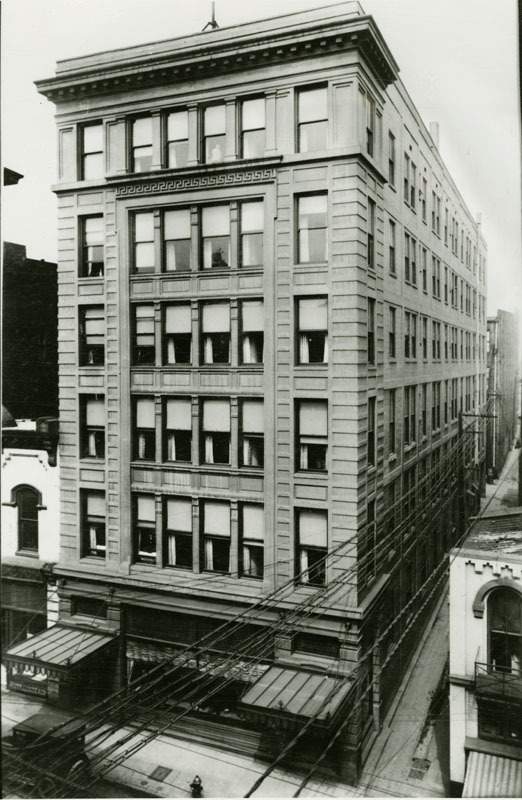 Touting a building as fireproof in 1905 was most likely very smart salesmanship as the "Million Dollar Fire" had taken place just across Gay Street in 1897. The Vandeventer became the St. James in 1916. The place contained 150 rooms with baths, not bad for 1915. 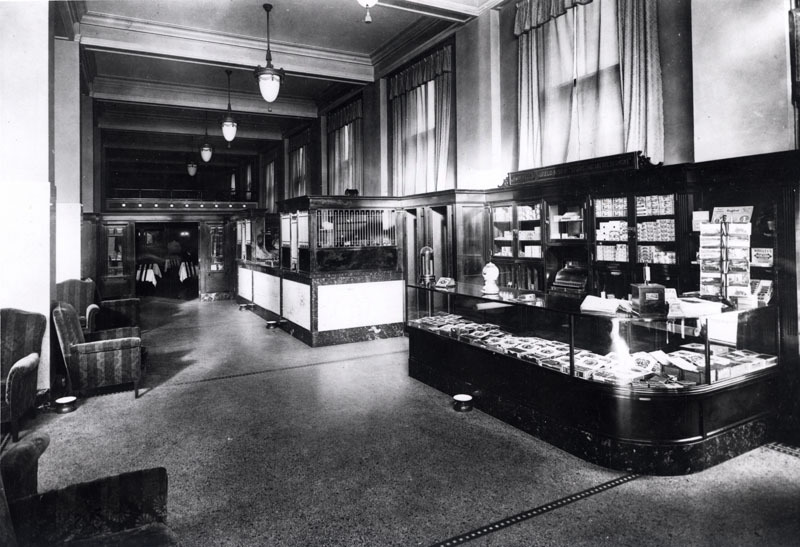 The WNOX studio was located on the Mezzanine (read second floor). It was an average hotel, not as nice as the Farragut but not bad either. An advertisement in the Knoxville City Directory described the hotel as "Modern, Fireproof, and European," the last descriptor probably referring to the restaurant in the hotel. Most pictures of the hotel, depict it from the front, probably because it wasn't too descript from the other directions. Before the addition of the St. James sign. After the sign went up (just look at all of those power lines). the same view as the top photo but the power lines are removed). fond of the fact that the adjacent building was actually made of clouds. I was able to identify one shot of the St. James, showing a side that never made it onto the post cards. It wasn't the prettiest aspect of the structure. The hotel interior was very respectable looking, decked out in post-Victorian decor. The hotel lobby, looking in from Wall Ave. Dining at the St. James. Without a doubt, the St. James was a fine place to stay. In fact, it became the kind of place where people stayed for months at a time (not uncommon among downtown hotels). This is the way the St. James looked shortly before it was torn down. It didn't look nearly as grand in the late 1960's, but that rock-solid structure was withstanding the test of time. Unfortunately for the "Cradle of Country Music", the St. James was torn down with no fanfare in 1973. Looking East (just look at how full downtown is, Gay St. is unbroken). An earlier view depicting the sooty smoke for which Knoxville was so well known. Today, the St. James is missing along with all of its neighbors that once lined the northern end of Market Square. The TVA Fountains are pretty in the Summer at least. Next time, we will move onward and explore a building that survived a near miss with the wrecking ball (at least the majority). Until then, we will leave with a clue from the most famous song to make it out of the St. James Sessions - Leola Manning's "Arcade Building Moan"
That's gorgeous. It might not have been the prettiest building built in 1905 Knoxville, but the St. James was still way prettier than the TVA towers. Your blog is an exercise in torture. I love to read it, but it always breaks my heart to see what we've lost. Oh, the treble clef! I wondered what had happened to that thing. I think we should restore it -- maybe in something other than fiberglass? It might have been meant to be a tribute to country music, but it was a gaudy monstrosity straight out of the disco era. We are doomed to repeat the mistakes of the past if we forget how heinous disco was. I think about the treble clef from time to time. We must always remember that at one time, people thought of Spanish-Moorish style movie-palaces as gaudy monstrosities. Disco is the new rag-time. Another wonderfully informative post. What I come away with is the realization that, while every building cannot exist forever, urban density creates unconscious excitement and urban blank spaces destroy it. Some of the commenters have mentioned the "Cradle of Country Music Park" and the Treble Clef with fondness, but that area was created at the expense of the urban life-giving grid. The 200 block of Gay and the open area where Summit Hill Drive curves are barriers to downtown life. The 200 block of Gay needs a building, not a surface lot. And, if we are stuck with an open area where the Treble Clef was, why not make it really distinctive. It seems to be crying out for a water feature. But, don't get me started on the destructive quality of the TVA buildings, and most importantly, their distinct lack of any architectural integrity. I saw a proposal a few years ago where someone had proposed realigning the streets around the Treble Clef park so that a square would be formed (somewhat like those found in Savannah). It seemed pretty solid to me (which is probably why the city leaders didn't even consider it). You are correct though, the surface lot on the 200 block is disgraceful. John, do have any information on Hurst's Boarding House and Dining Room? It also was on Wall Ave. My step-grandfather and grandmother owned. You could sit in his office on the second floor and look down at the Golden Sun and Market Square. I would love to have any information or photo you might have about it. New convert to your blog, John. I live in FL but have been making frequent social visits to Knoxville. I love the city on several levels and am greatly intrigued by your writing, here, as always. I have a question. In the aerial view of the hotel, looking east, I can't seem to locate any sign of (that era's version of) Market Square. I'm not up on that square's history, other than that some version of a common meeting area has been there since well back in the 1800's, I think. So, why do I see what appears to be an unbroken assemblage of buildings, in the area to the immediate SE of the Hotel St. James? "FL guy," again. Just want to add that I've actually walked that country music tour and thoroughly enjoyed it. Does this make me famous? If you look at the aerial shot "looking east", Market Square is at 4 o'clock from the St. James. You may notice the pointy looking building in the center of the photo with the long extension going to the right. That is the old city hall (the pointy part) and the market house (the long part). The market house burned in the 50's, so we were left with an open square. That's probably why it looks weird to you. Thanks for clearing up my confusion about Market Square, John. On a side note....when I'd indicated the direction of "SE," I was momentarily thinking in error that North was at the top of the photo in question. I'll have to read up on the history of Market Square. I'm quickly realizing how much of Knoxville's downtown has been affected by fires.